Gaiutra Bahadur, author of Coolie Woman: The Odyssey of Indenture put Lalbihari Sharma’s Holi Songs of Demerara in my hands. This text was composed in 1916 in a mix of Awadhi and Bhojpuri by an indentured laborer in Guyana. He chronicles life on the plantation, suffering at the hands of the British, and nirgun philosophy — a philosophy that holds the human soul as not separate from the Divine. I was now tasked to translate this cycle of chautals, dohe, and bhajans into American English poetry (forthcoming 2019 from Kaya Press). The main question I kept asking myself was “How do I pin down a folksong? There are worldviews at stake. How do you migrate something as complicated as ‘Ram ban mein gayal?’ Ram went into the forest.” But there’s backstory that most people from my grandmother’s community would understand off the bat. “Ram was exiled to be in the forest for fourteen years by his father who promised his third wife that he would fulfill whatever boons she wished.” Not so poetic. What is instantly remarkable about these poems is their continuance of Indian poetic inheritances. To use Braj Bhasha automatically calls to the reader’s attention the conversations with bhakti devotional poets. These poets from the fifteenth and sixteenth centuries in India formed a brand of spirituality that relied on a divinity closer than that of the organized rituals prescribed by the Vedas. He does this specifically by reckoning the nirgun and sagun bhakti poetics by elaborating his own claims as being specifically tied to the soul’s journey from the material/illusory to the Real, the human condition according to Vedantic Hindu philosophy. you are alone and destitute. Here, there is a direct connection to the padas and dohas of Kabir whose philosophy relies on the duality of the Real and Maya, the Illusion. In Kabir’s message, in order to escape the torture of illusion, one must chant the name of Rama. Here the name of the divine is Rama but not in the sense of Rama, the sagun deity, son of King Dasharatha, but Rama as the eternal life force, the Real behind the Maya. Lalbihari consciously makes this connection through his work as he negotiates the two forms of devotion. Throughout this collection, despite his reliance on nirgun bhati poetics, his stakes are those lodged firmly in sagun bhakti. month of Phagun without my love. The papiha bird cries, Piya. This gulf between us overcomes me. As far as the architecture of this book of songs as poems is concerned, Sharma engages with the material concerns of life on the sugar plantations initially and draws a subconscious parallel between indenture and exile much in the way that the Ramayana does as it traces the exile of Rama and Sita from their kingdom in Awadh. After considering the material conditions, Sharma attempts to escape them in favor of both Phagwa/Holi, but also in the narration of sacred myth. His next movement is into the pain from separation from the beloved that shows the evidence of familiarity with the poetry of Mirabai. Here Sharma is able to delve into the psychic realms of indentureship where India is the beloved, or, perhaps more interestingly, the pains of migration and severance from his original community as a metaphor for the human separation from the divine. Perhaps this trope also works in reverse. Here a new poetic emerges: one of indentureship as a new form of separation and torture. As Mirabai does in her poetry, Sharma creates a duality: the Lover and the Beloved. The Lover is the one who has been abandoned by the Beloved and is searching for him, usually Krishna. In this body of work, Sharma harnesses the emotive power of this discourse to create a new paradigm for understanding separation and exile. 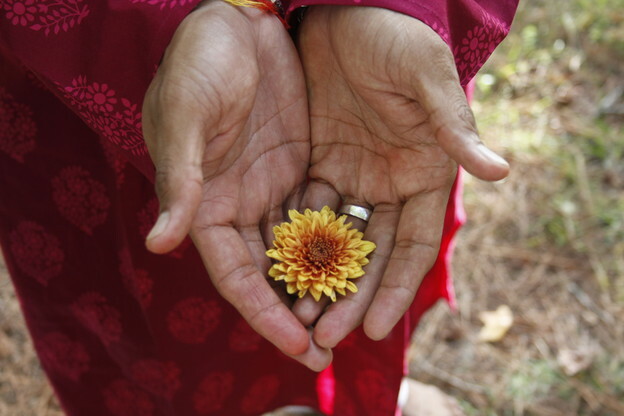 He marries sagun bhakti traditions together in a discussion of exile and separation. Here the Ramayana meets Krishna mythology in a way that highlights a need for salvation and the coming rescue of the divine. Not only is Radha in the Krishna myth made multifaceted through consideration of sexual desire, but here the materiality of this new association — the Indian separated from the original context — is a new way of engaging the Maya/Real complex. In these songs the poet reconciles with the divine. Read as epistles to the reader, the poet speaks directly to his audience showing the way to liberation. Now imagine you are a great great grandchild of indentured laborers who survived the violence of cultural erasure and colonialism. In your home Hindi is a foreign language. Even trying to pronounce the retroflexed and aspirated consonants at first seems a Herculean feat of tongue bending. Yet something unnamable drives you to speak your mother’s and father’s names as they were intended to be spoken. You take to sitting at your Aji’s feet, learning her songs and language that she couldn’t pass on to any of her children or other grandchildren. In this English speaking country, who has time for coolie poetry but the mad? And after learning what you could from her and from living in India for two years, Gaiutra Bahadur, author of Coolie Woman: the Odyssey in Indian Indenture, presents you with a copy of Damra Phaag Bahar: Holi Songs of Demerara by Lalbihari Sharma to translate. She used a rudimentary translation in her work after digging it up from a library in England. Along with the facsimile, she gives you a copy of a translated version that you use to check your own work against. You turn up the volume and add music to the line. Your family is from Berbice, at least has been from Berbice for three generations, coolies bound to the Skeldon sugar estate. As an attempt to keep these songs fresh and to have them flow again in your own practice of poetry, you open the book and put your pen to the page. Allow yourself to be part of the transformation. You are a translator. Take these lines from my grandmother’s songs and translate them into American English poetry. Don’t rely on a word-for-word substitution approach. Allow the musicality of the line to influence the poetic line. Give the backstory as much as you can in your translations. Remember you are writing for a Western audience who would not understand the references. To show how rich the poetic is, don’t flatten out the original writing. Now that you’ve written your first draft, here are some things you must include to make the poetic legible to a Western audience. This is actually a death song about leaving the body to go into the afterlife. Without changing the wording, let your reader into this nirgun bhakti tradition where the Beloved is the Divine and the “bride” is the human soul. These verses also reference the Bhagawad Gita 2:22 “Krishna says to Arjun: Just like a person casts aside worn out clothes and puts new ones on, the human soul casts off a worn out body and enters a new body.” Show the intertexuality. There are also more contemporary Bollywood songs that use this same metaphor for the human soul. In your translation, choose appropriate wording to make sure the reader understands the poet is one that is widely used in contemporary pop culture.